What ‘makes’ a poet, or brings him to maturity, is always debatable and in Rilke’s case a great deal went into shaping his characteristic lyrical modes and his approach to his work – including a problematic childhood; an intimate early relationship with the brilliant and urbane Lou Andreas-Salomé; travels to Russia and Italy; and his close familiarity with visual artists, including the work of the sculptor Clara Westhoff whom he married. However, perhaps the crucial event in his poetic life was his meeting with the sculptor Auguste Rodin, about whom he wrote, and for whom he worked as a secretary for a time. This meeting, combined with the influence of the work of the painter, Paul Cézanne, radically changed Rilke’s writing. Following Rodin’s and Cézanne’s examples, he learnt to ‘see’ differently and immersively. He eschewed the overt subjectivity of his earlier poetry and began to try to find the thinginess in the things he saw. He began to practice a form of what Keats’ earlier and famously refereed to as ‘negative capability’ (when a poet is ‘capable of being in uncertainties, Mysteries, doubts, without any irritable reaching after fact & reason’). In Rilke’s case, this led him to write, among other works, two volumes of New Poems. Luke Fischer’s study of Rilke focuses on this period and these poems. While the New Poems have already been the subject of much critical inquiry and commentary, Fischer makes the case for reading them freshly. He believes that in these works Rilke largely resolves the artistic problems resulting from dualism. By working as a poet-phenomenologist, Rilke brings us close to the things that he sees, even entering into or intuiting their ‘essence’. Fischer spends the first of his four main chapters outlining his philosophical position as it relates to his reading of Rilke. For Fischer, because of its ‘experiential’ dimensions dualism is not merely a philosophical or theoretical issue. He argues that only a phenomenological approach can reveal and express what experience is like and that the problem of dualism should thus be approached phenomenologically. This, in turn, allows Fischer to explore ways of understanding the human Other and to examine the possibility of ‘non-dualistic disclosure’. While at times this chapter is slightly heavy going, Fischer provides a cogent and generally persuasive discussion of his philosophical position with reference to thinkers such as Scheler, Heidegger, Kant, Husserl, Merleau-Ponty and others. Fischer is interested in a variety of complex issues, including a ‘way of seeing that involves a close intertwining of the sensible and the intelligible’, and the ‘active-passivity’ in thought and perception which ‘transcends’ the tendency for people to think in terms of dualities such as active/passive and subjective/objective – as well as in the ‘genuine disclosure of the individual Other’ already mentioned. Later chapters are suggestively entitled ‘Learning to See: Rilke and the Visual Arts’, ‘Rilke as Seer: A Twofold Vision of Nature’, and ‘the Neue Gedichte (New Poems) as a Twofold Imagining of Things’. For Fischer, poetry offers the possibility of resolving, at least implicitly, some issues attending to dualism that philosophy cannot easily resolve. 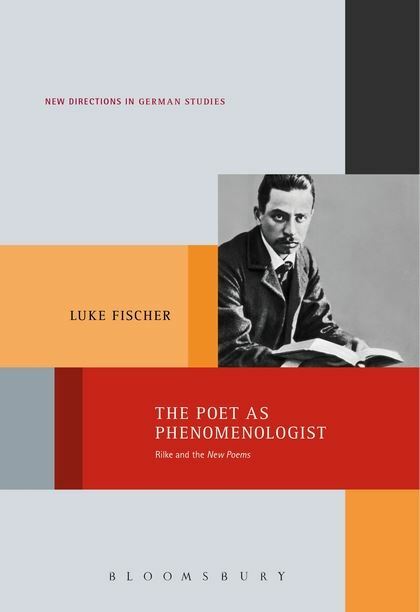 Fischer contends that Rilke’s New Poems are the best example of Rilke’s way of seeing and imagining as a poet-phenomenologist. He argues against the metaphysical view of Rilke’s work, and for Rilke’s status as a kind of poet-seer, who learnt (mainly from Rodin and Cézanne) the relationship between the exterior of a person or thing, and the volume, or innerness, that lies behind the exterior. For Rilke in his new mode, as for Rodin, a successful poem or a sculpture, expresses not the thing itself exactly as it is, but instead captures the nature or essence of the thing as it may be understood by thinking around and through and within it (this is not Fischer’s language, but it gives an idea of what interests him). He argues that Rilke in his New Poems is not a poet who provides a subjective vision of the world, but instead resolves the dualism between the subjective and the objective. Rilke thus exemplifies for Fischer a way of apprehending the world that allows for a proper respect to be paid to the relationships between an individual and the Other, whether that Other is a person, an animal, a plant, or an inanimate object. Fischer not only discusses philosophy, but also discusses a good number of Rilke’s poems. These analyses are aimed at providing evidence for his view of Rilke’s way of seeing and thinking and, by and large, they are convincing. His discussion of how Rilke’s poetry reveals ‘a phenomenology of epiphanic vision’ is particularly interesting. Occasionally, Fischer makes a claim that he is unable to fully substantiate. An example is when he attempts to ‘articulate the possibility of a dynamic, physiognomic perception of animals that transcends anthropomorphic projection’ and asserts that ‘Rilke’s systematic attempt to enter the animal world facilitated a transcendence of solipsism and anthropomorphism and a disclosure, in each case, of the animal’s being’. Fischer does make a good case for Rilke’s remarkable sympathy with animals, and his capacity to engage in an authentic relationship with them, even entering into their ‘being’ (certainly Rilke believed that he could achieve this). However Rilke, for all his brilliance, does not avoid significant anthropomorphism in his poems and I am not convinced that animals are not considerably more alien to human beings than Rilke’s poems generally understand or Fischer’s arguments seem to allow. More generally, almost all of this volume’s poetic analyses are in the cause of demonstrating one or other aspect of the book’s main set of theses. While this is entirely understandable, occasionally I yearned for more suggestive and open interpretations of Rilke’s work. For example, when Fischer analyses Rilke’s ‘The Swan’, and writes ‘I am not entirely opposed to discovering a human meaning (i.e. the animal as symbolic of human matters) in Rilke’s animal poetry’, this hesitancy is somewhat awkward. ‘The Swan’, in Fischer’s own translation, begins ‘This toil, to proceed heavily and as if bound/ through what remains undone,/ resembles the unmade gait of the swan. // And dying (resembles), this no longer holding/ to the ground on which we daily stand.’ Fischer says he is ‘largely in agreement’ with the position of another critic, that the swan (which is clearly symbolic in this beautiful poem, whatever else it may be), is ‘not a symbol, but a “phenomenon”’. Such an attempt to limit the ramifying interpretive possibilities of Rilke’s poem weakens a little the otherwise persuasive argument that Fischer makes about this work. Overall, however, this is a cogent and enlightening volume that brings a new, systematic and thoughtful set of perspectives to the understanding of Rilke’s New Poems – and, in doing so, also provides highly suggestive ways of approaching and reading Rilke’s late masterpieces, the Duino Elegies and the Sonnets to Orpheus (although Fischer deliberately does not extend his discussion into any sustained consideration of these complex works). The volume makes a very good case that Rilke’s poetry offers ways of apprehending the things of the world in ways that reach beyond philosophy into a significant imaginative engagement with both the quotidian and the mystical; and that he provides a method and vision that is larger, more encompassing and more generous – and less destructive – than scientific and materialist approaches to the Other. In Fischer’s reading, Rilke may be a poet for the future of humankind, providing a constructive vision of the possibilities of ‘being-in-the-world’, along with new ways of holistic thinking and seeing, in our time of cultural crisis. This entry was posted in BOOK REVIEWS and tagged Luke Fischer, Paul Hetherington, Rainer Maria Rilke. Bookmark the permalink.